Top 3 UNESCO countries: China, Italy, and Spain - but why? Did you know that China and Italy jointly hold the top spot in the countries with most UNESCO World Heritage sites? What makes them top the list? Whereas the other 2 countries, Italy and Spain are there thanks to lots of cultural icons China boasts a relevant number of natural sites most of which are generally unknown to the majority of the travellers. Here are the top-3 UNESCO countries on the globe. Even if, like me, you are a well travelled person chances are that you may have never heard of 90% of the listings under China. However, many of them are stunning and unique. My favourite ones are below. Mount Sanqingshan National Park below inscribed in UNESCO’s words because of “its exceptional scenic quality, marked by the concentration of fantastically shaped pillars and peaks: 48 granite peaks and 89 granite pillars, many of which resemble human or animal silhouettes”. The park also has numerous waterfalls reaching 60m in height. 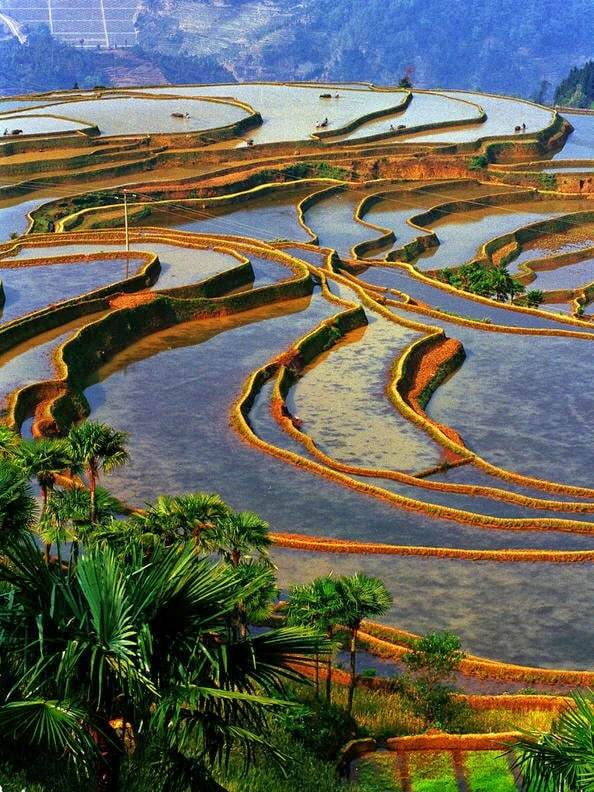 Another stunning site is the Cultural landscape of the Honghe Hani Rice Terraces which, like Banaue in the Philippines, is a magical conglomerate of rice terraces snaking through mountains. “Over the past 1,300 years, the Hani people have developed a complex system of channels to bring water from the forested mountaintops to the terraces. They have also created an integrated farming system that involves buffaloes, cattle, ducks, fish and eel and supports the production of red rice, the area’s primary crop. The inhabitants worship the sun, moon, mountains, rivers, forests and other natural phenomena including fire. The resilient land management system of the rice terraces demonstrates extraordinary harmony between people and their environment, both visually and ecologically, based on exceptional and long-standing social and religious structures. Xinjiang Tianshan reminds me of the Red Tsingy in Madagascar. The red soil canyons and snow peaked glaciers lay next to deserted areas creating a very sharp contrast. 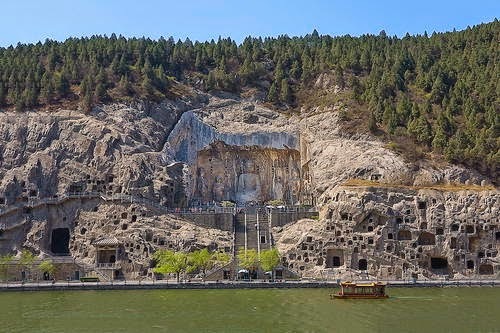 What a labyrinth it must have been to live in the grottoes all perfectly carves and facing the river. The site contained the largest collection of Chinese art and was entirely devoted to Buddhism. 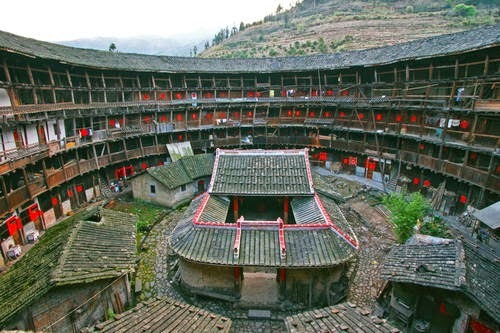 Fujian Tulou were earthen houses built to host up to 800 people in circular shape. Despite their very plain exterior inside they are designed for comfort. the strange shape made them easier to defend. They are considered exceptional in their communal living ideals and their integration with the environment. China’s listing includes a variety of temples and other religious constructions such as the Temple of Heaven in Beijing, the Imperial Tombs of Qing and Ming or the Temple and Cementery of Confucius and also some very well known sites such as the Tibetan Palace of Potala, the historic centre of Macau, the Giant Panda Sanctuaries or the Great Wall of China. Everybody dreams of going to Italy once in their life. The Romans left an imprint in this beautiful peninsula which has remained till today. Florence, Tuscany, Pisa, Venice, Siena, Naples, Ferrara, Verona and Urbino among other are all listed historic city centres. To that, add the Amalfi Coast and The Dolomites in the natural category and a few religious sites like the Cathedral in Modena or the Convent of Santa Italy Maria delle Grazie with “The Last Supper” by Leonardo da Vinci is a true feast to the senses. Most of the sites are easily reachable thanks to their urban nature and the excellent infrastructure making it accessible on any visit to the country. It shares the stop spot with China thanks to two new listings in 2013. China also had an additional listing in 2013 so both countries tied. But Italy also has a few hidden gems in the UNESCO list. 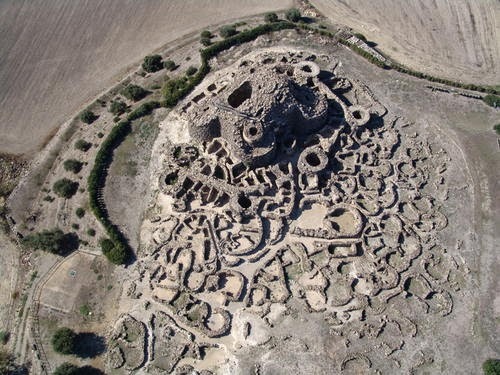 Have you heard of Su Nuraxi di Barumini? Neither had I but it is included in the UNESCO World Heritage List because it is a unique defence structure not found anywhere else. From the remains one can imagine the shape and structure of the original city but it remains a mystery why it had such a layout. And Mount Etna, an active volcano that continues to serve as a major source of learnings and developments in the volcanic world thanks to its constant activity. My beloved country has a lot to offer to any would-be visitor and UNESCO sites is just one of them. Almost all of the inscriptions are of cultural origins and what makes Spain so unique is that through the UNESCO sites one can understand centuries worth of history from the Paleolithic times in the Altamira Caves where cave carvings and writings represent life to the more recent Gaudi. After Altamira’s Paleolithic caves you can travel through the Carthaginians times during the 3rd century BC in the city of Salamanca and then marvel yourself at the Aqueduct in Segovia built in 50 AD. Contemporary to that the City of Merida still has a preserved ampitheatre, theatre, circus and water-supply system. And the city of Tarraco, today Tarragona, only 100km south of Barcelona, has all the Roman remains intact including the city walls. From the 12th century we have the Poblet Monastery which is indeed a beautiful place. Nowadays, one can visit it on a day trip from Barcelona and enjoy a tour followed by tasting of several sweets and local delicacies being sold in a Medieval looking market in the weekends set around the entrance to the Monastery. Cordoba’s Grand Mosque or Granada’s Alhambra both from the 13th Century during the Moor’s occupation of Spain are fine examples of Muslim architecture. The gardens in la Alhambra high up the mountains are beautiful and afford a great view of the snow capped mountains and of the Middle Eastern looking city of Granada. In the same area of Andalucia, Seville’s La Giralda is the largest Gothic building in Europe. Almost at the same time these Muslim constructions were being built the Cathedral of Burgos started to take shape in another part of Spain untouched by the Emirs. The Moors had a huge impact on Spain and not just in the south and until the “Marca Hispanica”, as the imaginary border they reached is called, but also on other areas where battles took place. Particularly interesting and beautiful is Santiago de Compostela with its Romanesque, Gothic and Baroque buildings, the Old Town of Santiago is one of the world’s most beautiful urban areas and it was re-built in the 11th century after it was destroyed in a battle to contain the Muslims. Their influence continued in several other monuments. In the words of the UNESCO listing “Avila was founded in the 11th century to protect the Spanish territories from the Moors, this ‘City of Saints and Stones’, the birthplace of St Teresa and the burial place of the Grand Inquisitor Torquemada, has kept its medieval austerity. This purity of form can still be seen in the Gothic cathedral and the fortifications which, with their 82 semicircular towers and nine gates, are the most complete in Spain”. Even after they were defeated through the “Reconquista” the Moors continued to influence architecture and arts in Aragon where Mudejar Art was present until the 17th century. The 16th Century saw the construction of the Escurial Monastery, a very austere structure. Gaudi’s magic bring us to the 20th Century with Sagrada Familia, Parc Guell and other sites representing a world that only Gaudi could understand and which, through explanations, scaled reproductions and tales of forgotten dreams we can only begin to imagine. No matter how many times I visit the Sagrada Familia, Casa Batllo, La Pedrera or the Park Guell they always seem like an old friend who is constantly growing up. Here is my full guide to Sagrada Familia and while you’re there my guide to Barcelona! Here are some great luxe hotels to stay at. 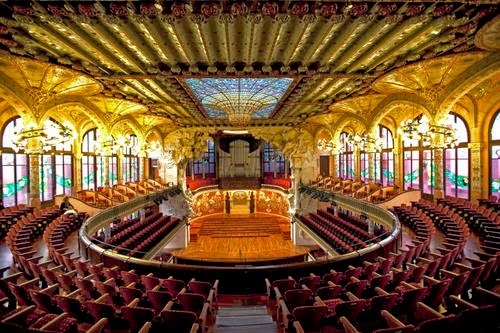 From the same time as Gaudi the Palau de la Musica is an incredibly colorful and amazing building from the outside but its true beauty can only be seen inside when the tainted glass ceiling reveals itself. You only have a few days in Spain but still want to experience all civilisations in one? In Toledo you will find 2,000 years worth of culture and civilisations. It was a Roman city, the capital of the Visigoth Kingdom, a fortress of the Emirate of Cordoba, a fighting centre against the Moors and the temporary seat of supreme power under Charles V.
Have you been to any of these three countries? Which UNESCO site amazed you the most?